1NASA Ames Research Center, Moffett Field, USA; 2California State University Monterey Bay, Seaside, USA. Negative trends in the monthly MODerate resolution Imaging Spectroradiometer (MODIS) Enhanced Vegetation Index (EVI) time-series were found to be widespread in natural (non-cropland) ecosystems of the eastern United States from 2000 to 2010. Four sub-regions were detected with significant declines in summed growing season (May-September) EVI, namely the Upper Great Lakes, the Southern Appalachian, the Mid-Atlantic, and the southeastern Coastal Plain forests ecosystems. More than 20% of the undeveloped ecosystem areas in the four sub-regions with significant negative EVI growing season trends were classified as forested land cover over the entire study period. We detected relationships between annual temperature and precipitation patterns and negative forest EVI trends across these regions. Change patterns in both the climate moisture index (CMI) and growing degree days (GDD) were associated with declining forest EVI growing season trends. We conclude that temperature warming-induced change and variability of precipitation at local and regional scales may have altered the growth trends of large forested areas of the eastern United States over the past decade. There is considerable uncertainty about changing growth rates of forests in the eastern United States. Based on a small number of field site measurements, forest biomass accumulation was reported to be accelerating in the region at locations where nutrients and water were not limiting [1,2]. At the same time, reduction of wildfire throughout the eastern US has evidently converted more lands to closed-canopy forests with more shade-tolerant, fire-sensitive plants . Standing in contrast to these results are a number of recent climate change impact studies on the region. Over the last century, the eastern US has become warmer, particularly since 1970 at the rate of 0.45˚F per decade . Outbreaks of insect pests and introduced pathogens have become dominant forces driving changes in forests of the eastern US . The effects of longer vegetation growing seasons and periodic drought on US plant production have been reported [6,7]. further examined changing soil freezethaw signal from satellite microwave remote sensing and vegetation greenness patterns for the 9-year (2000-2008) vegetation record from satellites over North America, and reported that the relationship between the non-frozen period (Jun-Aug) and mean summer greenness index anomalies was generally positive for tundra and boreal forests areas of Canada, but was negative for temperate forest areas of the eastern US, for which they suggested that moisture availability was a critical control on annual forest growth patterns. Satellite remote sensing has been shown to be an accurate method to monitor large-scale regrowth of green vegetation cover and productivity, especially following disturbance [9-12]. In this study, we utilized over ten years of the MODerate resolution Imaging Spectroradiometer (MODIS) Enhanced Vegetation Index (EVI) satellite data to examine the relationships between natural (nondeveloped) vegetation growth trends and climate indices in ecosystems of the eastern US. The study area covered all of the eastern United States over the time period from 2000 to 2010 (Figure 1). Figure 1. Slope of the time-based (2000-2010) EVI regression in natural ecosystem areas of the eastern US region. Green shades indicate a positive slope of increasing growing season EVI, whereas brown shades indicate a negative slope of decreasing growing season EVI. Four general sub-regions listed in Table 1 are identified in red lines and were delineated for analysis according to Major Land Resource Areas (MLRAs, source: US geological survey and the natural resources conservation service, USDA) shown in blue lines. data are cloud-free spatial composites of the gridded 16- day 1-kilometer MOD13A2 product, and were provided monthly as a level-3 product projected on a 0.05 degree (5600-meter) geographic Climate Modeling Grid (CMG). Cloud-free global coverage at 8-km spatial resolution was achieved by replacing clouds with the historical MODIS time-series EVI record. MODIS EVI was calculated from red, blue and NIR bands as described by . Monthly EVI values were summed across each six-month growing season period (May through September) to represent the variability in vegetation productivity for the past 11 years. The National Monitoring Trends in Burn Severity (MTBS, ) data set was used with a 4-km buffer zone to mask out any perimeters of wildfires across all lands of the eastern U. S. for the period spanning 2000 through 2010. Land cover classes from MODIS 500-km global products (MCD12Q1, ) from both the years 2001 and 2009 were aggregated to 8-km resolution and compared for vegetation change detection and exclusion of nonnatural (e.g., developed as cropland or urban) ecosystem areas from the analysis. PRISM (Parameter-elevation Regressions on Independent Slopes Model) data sets were used for precipitation, average maximum temperature, and average minimum temperature . These 4-km climatologies were derived from US weather stations records interpolated first into 30 arc-second data sets. PRISM is unique in that it incorporates a spatial knowledge base that accounts for topographic influences such as rain shadows, temperature inversions, and coastal effects, in the climate mapping process. Monthly potential evapotranspiration (PET) from global sources  were also prepared for analysis. Annual climate indexes for each year 2000-2010 were calculated from these monthly meteorological datasets to use as independent explanatory variables. The climate index selection was based on previous study results from , which showed that degree days, annual precipitation totals, and an annual moisture index together can account to 70% - 80% of the geographical variation in the global vegetation seasonal extremes. Selected indexes in this study included: the climate moisture index (CMI, ) and growing degree days (GDD) base 0˚C. The CMI indicator ranges from –1 to +1, with negative values for relatively dry years, and positive values for relatively wet years. GDD is the number of days for which mean monthly temperature was greater than 0˚C. According to the values of the slope and the coefficient of determination (R2) of the EVI time-based regressions, all ecosystem pixels were classified into one of three categories: 1) Pixels with a positive trend, where Slope > 0 and a 95% level of significance for a two-tailed t-test (R2 ≥ 0.37); 2) Pixels with a negative trend with a 95% level of significance (where Slope < 0 and R2 ≥ 0.37); 3) Pixels with a non-significant trend (R2 < 0.37, Slope > 0, or Slope < 0). The “Breaks for Additive Seasonal and Trend” method (BFAST, [20,21]) was further applied to the EVI monthly time series for annual trend characterization. analyzed trends in normalized difference vegetation index (NDVI) satellite data between 1982 and 2008 using the BFAST procedure and detected both abrupt and gradual changes in large parts of the world, especially in (semi-arid) shrubland and grassland biomes where abrupt greening was often followed by gradual browning. 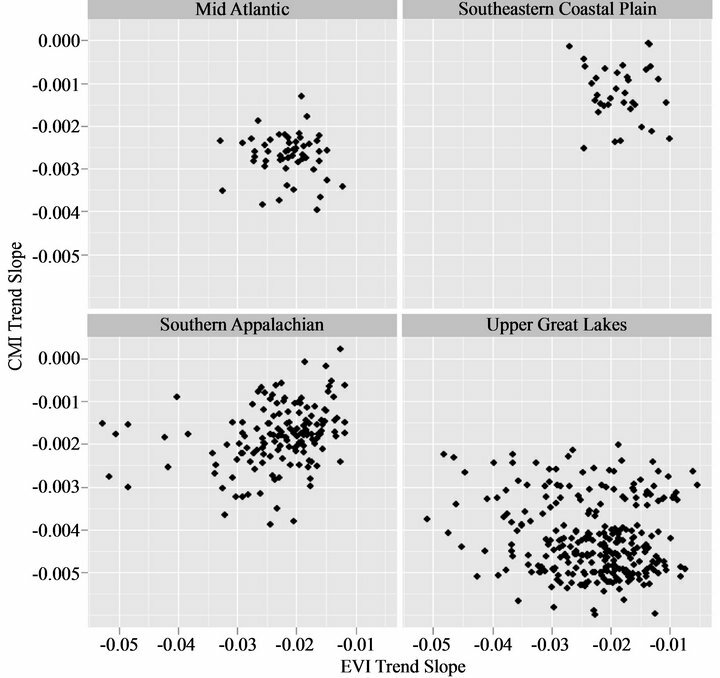 Significant negative EVI trends were found to be widespread in natural ecosystems of the eastern US from 2000 to 2010 (Figure 1). Four sub-regions were identified with extensive areas of decline in growing season EVI, namely the Upper (northwestern) Great Lakes, the Southern Appalachian, the Mid-Atlantic, and the southeastern Coastal Plain ecosystems. A range of 13% (northwestern Great Lakes and Southern Appalachian) to 47% (Mid-Atlantic) of unburned ecosystem area in the four sub-regions of the eastern US was detected with significant negative EVI trends over the study period (Table 1). Out of the four sub-regions, only the southeastern Coastal Plain (with >10% burned area within the significant negative EVI trend category) was partially impacted by wildfires at a frequency of more than 1% of the total natural (forest and shrubland) area burned. Overall, 17% of all ecosystem areas (and 10% of all forest areas) in the four subregions were detected with significant negative EVI trends over the study period. Only the northwestern Great Lakes sub-region was detected as having a notable (1.6%) area coverage with significant positive EVI trends over the study period (Table 1), none of which could be attributed to regrowth following forest fires. Table 1. Area (in km2) of growing season EVI trends in sub-regions of the eastern US over the period 2000-2010. Table 2. Land cover change confusion matrix for 8-km pixel areas aggregated from 500-m MODIS cover classes for 2001 and 2009 determined by >75% majority coverage in the four sub-regions shown in Table 1. Table 3. Area of significant negative growing season EVI trends in forests sub-regions of the eastern US over the period 2000-2010.
areas over the EVI analysis study period of 2000 to 2010, we hypothesized that the consistent decline in growing season EVI must be attributed to climate-related factors. Break point analysis on forest areas with significant negative EVI trends in the region revealed that nearly 63% of all negative trend areas in the four sub-regions had zero break points, which indicated that growth rates declined gradually and consistently during the MODIS observation period (2000-2010). The other 37% (Table 4) of all negative trend areas detected with one or more break point over past decade appear to have had vegetation growth abruptly interrupted by some external factor (e.g., extreme weather events, insect damage), leading to a sudden decline in growing season EVI. A strong association was observed between the slope of annual CMI and negative EVI trends (Figure 2(a)). Nearly all the forest areas in the four sub-regions of the eastern US detected with significant negative EVI trends were associated with relative drying trends (i.e., strongly negative CMI slope values). The Upper Great Lakes region showed the strongest association between negative annual CMI and negative growing season EVI trends. These results suggest that dry years in this sub-region are closely related to declines in forest growth as detected by trends in summer-time EVI. Table 4. Percentage categories from the BFAST break point analysis for forest sub-regions of the eastern US with significant negative EVI trends from 2000-2010. Appalachian sub-region showed the weakest associations between negative forest EVI trends and either CMI or GDD (drying or warming, respectively) trends over the period 2000 to 2010. We postulate that the complex topography, hydrology, and variable elevation zones of mountainous areas in the Appalachian region can confound association analysis of climate trends with EVI trends, at least more so than within the other sub-regions. The MODIS EVI time-series data used in this study provided consistent large-scale metrics of forest growth trends across the eastern US region. Temperature warming-induced change and inter-annual variability of precipitation at local and regional scales may have altered the trends of large forest growth and could be impacting the resilience of forest ecosystems across certain sub-regions. Figure 2. 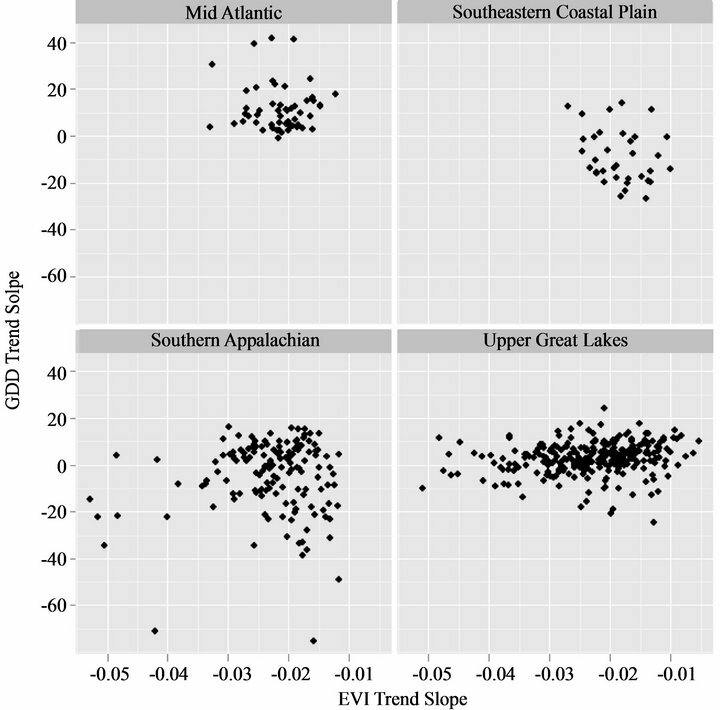 Associations of the trends (2000-2010) of significant negative EVI slope values with (a) CMI slope and (b) GDD slope in forest ecosystems of four sub-regions of the eastern US. to a small decline (0.001 - 0.004 yr - 1; 5% overall between 2002 and 2010) in NDVI under a range of simulated aerosol conditions and high-latitude surface types. Similar evaluations have not yet been conducted for sensor degradation impacts on MODIS EVI in mid-latitudes, such as the eastern US region in this study (D. Wang, personal communication), but we can add that over half of the forest areas detected with a decline in growing season EVI in our results above (Tables 3 and 4) exceeded 6% overall between 2000 and 2010 and the decline was frequently not gradual, such as could be attributed to MODIS sensor degradation. In summary, the methodology developed for mapping and characterization of forest growth trends can be readily extended over the next decade of Collection 6 MODIS EVI data. The results from BFAST break point analysis provides an additional trend decomposition method for local scale studies with higher resolution satellite data. Further research should be pursued in order to elucidate the developing relationship between forest growth decline and climate change in the eastern US region. This work was conducted with the support from NASA under the US National Climate Assessment. This research was also supported by an appointment of the second author to the NASA Postdoctoral Program at the NASA Ames Research Center, administered by Oak Ridge Associated Universities. We thank Vanessa Genovese, and Steven Klooster of California State University Monterey Bay for assistance with regional data sets and programming. LP-DACC: NASA Land Processes Distributed Active Archive Center, “MODIS/Terra Vegetation Indices Monthly L3 Global 0.05Deg CMG (MOD13C2),” 5th Edition, USGS/Earth Resources Observation and Science (EROS) Center, Sioux Falls, 2007. C. Daly, W. P. Gibson, M. Doggett, J. Smith and G. Taylor, “Up-to-Date Monthly Climate Maps for the Conterminous United States,” Proceedings of the 14th AMS Conference on Applied Climatology, 84th AMS Annual Meeting Combined Preprints, American Meteorological Society, Seattle, January 13-16, 2004, p. 5.